Bangor developer Roy Hubbard held an open house at the recently renovated Dakin Building apartments in Bangor. Hubbard is among 30 sailors who have been chosen to participate in the 2018 Golden Globe Race. Roy Hubbard, developer on the Dakin building project, as seen in this Nov. 28, 2014, BDN file photo. Hubbard is among 30 sailors who have been chosen to participate in the 2018 Golden Globe Race. BANGOR, Maine — Imagine sailing around the world in 300 days, guided by only a sextant and the stars, with limited contact with anything other than the sea and a 32-foot boat. It’s the 2018 Golden Globe Race, an elite challenge commemorating the 50th anniversary of a British man’s solo feat, and a Bangor developer is among just 30 sailors worldwide picked to take part. 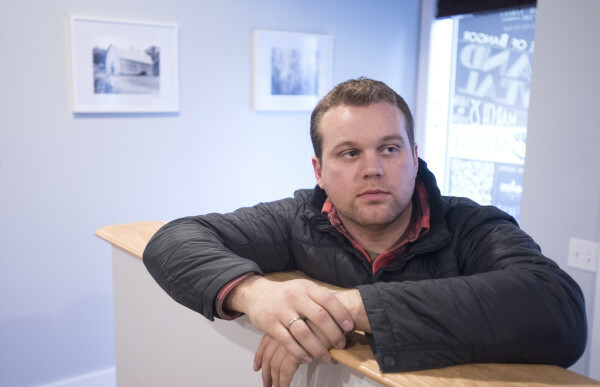 Roy Hubbard, 27, is a Connecticut native who came to Maine in 2008 to attend college. 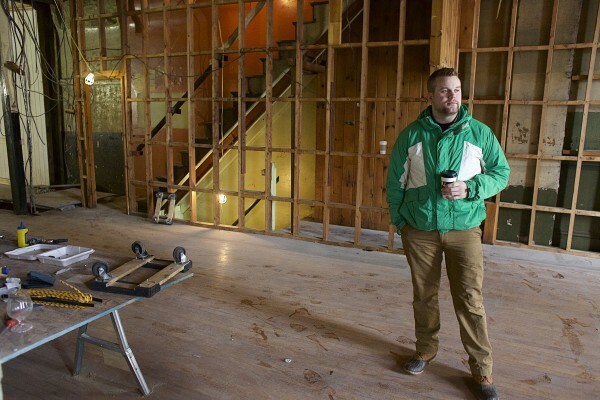 He left school to pursue a major redevelopment project in downtown Bangor — the conversion of the long-vacant Dakin Sporting Goods building into high-end loft apartments. He wrapped up that project just last month. With his development effort complete, Hubbard has turned his attention to preparing for the race, securing a boat and all the needed equipment, finding sponsors and logging about 10,000 miles of practice trips required before he can participate. The only other American in the race is Antonio Felipe García Martínez, 41, a Miami native born to Cuban refugees. The 25 provisional entrants, who applied to enter the race, will be joined by up to five additional sailors announced later in the process. They’re likely to be well known names in the sailing world. The maximum participation is 30, provided everyone makes it to the starting line. Hubbard has loved sailing since he was a child growing up in Connecticut. He idolized explorers, such as Sir Francis Drake and Sir Ernest Shackleton, and wanted to walk in their shoes. “There’s not a lot left new in the world to explore,” Hubbard said, but taking part in an elite contest like this is his as a way of paying homage to his idols, and having a great adventure of his own. Race organizers accepted his application. At age 8, Hubbard dug a neglected Sunfish sailboat out of his grandmother’s garage, cleaned it up and took it out on the water. He kept sailing, upgrading to larger boats over the years, until he came to Maine for college, where other obligations made his sailing excursions less frequent. Now, he’ll have to get back in the swing of things. “The only anxiety I have is something happening that would prevent me from getting to this race,” Hubbard said. He estimates he’ll have to raise $150,000 to $200,000 to secure a boat and all the necessary supplies and preparations. The Golden Globe was inspired by Robin Knox-Johnston, who on June 14, 1968, left Falmouth, England, in a 32-foot yacht to compete in the Sunday Times Golden Globe Race. The voyage took him south past Africa, south of Australia, across the Pacific and around Cape Horn, South America, before turning north to England. He won the race, despite suffering through numerous breakdowns, because he was the only one to finish. For the 50th anniversary of Knox-Johnston’s trip, Golden Globe organizers are trying to recreate his voyage as closely as possible. Participants must use a boat between 32 and 36 feet in length that meets a strict list of specifications. There’s no GPS, cellphones or other modern amenities that Knox-Johnston didn’t have available to him. If the sailor wants to listen to music, they can bring a cassette player. If they want to document their trips in pictures, they have to bring a 35-mm film camera. They’ll have to predict weather on their own, and won’t be allowed to get forecasts from the mainland. Participants carry a bag of safety supplies on board, but opening that bag means they forfeit the race. The boats will be monitored by satellite at all times. On occasion, they will allowed to contact loved ones using a long-range ham radio. The trip is expected to take at least 300 days to complete. “I’m out to do New England proud,” Hubbard said.